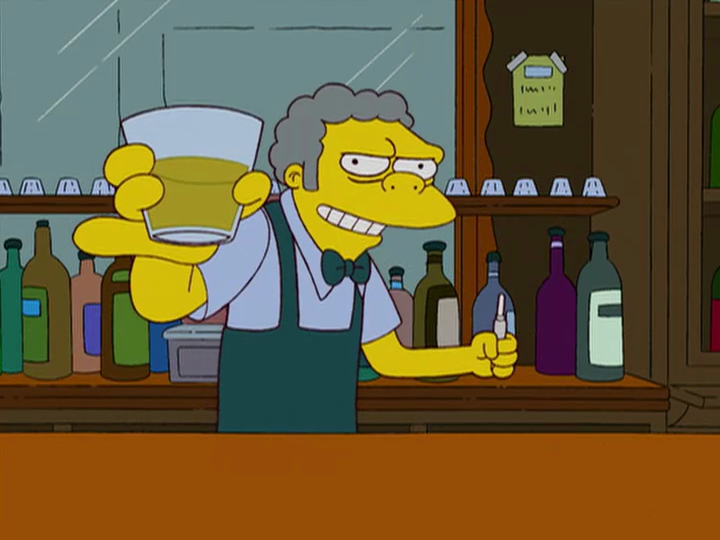 Moe holding a glass of Forget-Me-Shot. The Forget-Me-Shot is a drink served at Moe's Tavern. The drink wipes out the drinker's memory of the last 24 hours. Homer once drank it. The next day, he asked Moe if he was at the tavern the previous. Moe said he was, and that he had made him a Forget-Me-Shot. He then showed him a video of how to make the drink. After Moe showed him the video, Krusty came in and asked for one due to saying a rather offensive remark against Mexicans at the Latin Grammy Awards, only to forget the whole incident and walk right into a group of offended Mexicans who proceeded to "hot-sauce his eyes!". Add ingredients to a glass. Stir with a pregnancy test strip until the strip shows a positive result. Modified on June 21, 2015, at 12:02.